Join the Vermont Historical Society and the Vermont Commission for Women to celebrate Women’s History Month. Reidun Nuquist is the speaker for the evening, a longtime member of the Green Mountain Club who writes frequently on the history of the Long Trail. A Montpelier resident, she was a librarian at the Vermont Historical Society and the University of Vermont’s Bailey/Howe Library. 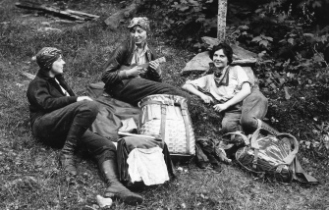 The Three Musketeers were a national sensation when they became the first women to hike the long trail from Canada to Massachusetts in 1927. But they are only the most famous of the many have completed the country’s oldest long-distance footpath. Over the past century numerous other women have followed in their footsteps, not just as hikers but as leaders of the Green Mountain Club. This program is free and open to the public. SAVE THE DATE for the Vermont Women’s Fund Benefit: Together We Can Change the Story for Women in Vermont! To learn more about Change the Story, a partnership between the Vermont Women’s Fund, Vermont Works for Women, and the Vermont Commission on Women, please click here. SAVE THE DATE for the Women’s “We Can” Expo and Conference! Featuring the VCW Commissioner Melinda Moulton, CEO of Main Street Landing as Keynote! The event costs $15 and includes lunch. Learn more and register at www.womenwecan.com. Mercy Connections, in partnership with the Vermont Department of Corrections, is hiring a part-time Mentee Coordinator to work with women transitioning out of prison. Must be able to inspire trust, demonstrate good judgement, exercise diplomacy and confidentiality. Position reports to Director of Justice & Mentoring and works in a team. Responsibilities include mentee recruitment, orientation, facilitating mentor matches and significant time at the Correction Facility. Experience in human services and /or criminal justice work preferred. 20-24 hours/week including some evenings. Position begins May 9. Equal opportunity employer. Please send resume and cover letter by Friday, March 25 to: Dolly Fleming, Executive Director, Mercy Connections dfleming@mercyconnections.org. Full position description here. Outright Vermont is Hiring a Camp Outright Coordinator! Camp Outright is a week-long residential summer camp for queer and trans youth, ages 13-22. Read more about Outright and Camp Outright! The Camp Outright Coordinator works in collaboration with a team of folks from both Outright and our partners at Common Ground Center to ensure the success of camp. The Camp Outright Coordinator is also primarily responsible for hiring and supervising our volunteer staff. We’re looking for someone with lots of relevant camp experience that has worked with youth ages 13-22 before. Basic queer competency is also a must, and a solid sense of humor is absolutely required. The position can be done remotely, although we’ll need you to be in Vermont for most of August. Camp Outright runs from August 12-20th. You will not be considered for this position if you are unavailable for those dates. Resumes and cover letters will be accepted until Thursday, March 24th—send to info@outrightvt.org or mail to Camp Outright, PO Box 5235 Burlington VT 05402. The Vermont Human Rights Commission February Newsletter is available here. Watch Preservation Burlington: Burlington’s Historic Women online here! Ron Wanamaker, Liisa Reimann and Britta Fenniman-Tonn join in a discussion on Burlington’s Historic Women. CLASP featured Vermont’s Paid Sick Day’s legislation in its March newsletter! Outright Vermont Awards Nominations Are Open! Nominating someone has never been easier! Each year Outright Vermont recognized eleven movers-and-shakers from around the state who have been working to make it better for queer and trans youth. Know a student activist who is building a supportive community in their school? There’s an Award for that! How about a family member ally – (chosen or blood) – who consistently shows unconditional love and support to a queer youth in their life? Nominate them for the Lil Venner Award! Check out all eleven Awards and nominate someone–all from the same page! Click here! Technology for Tomorrow is a nonprofit out of Williston that connects high schoolers with communities across Vermont to provide free technology workshops. Their goal is to bring communities together through technology by teaching individuals how to engage and participate more effectively with the community around them with the use of technology. These workshops rely on small group learning and one-on-one teaching lead by high school students. They host workshops on topics ranging from internet safety and smartphones, to word processing and email. If you are interested in attending a workshop, please visit Technology for Tomorrow’s calendar of events. They rely on high school student volunteers to provide one-on-one tutoring at workshops. They work with young women who are passionate about making an impact in someone’s life through education and technology training. If you are a student interested in starting a chapter at a high school please link to the site, www.tech4tomorrow.org and contact the Program Manager. The National Center for Victims of Crime, Stalking Resource Center, is conducting a needs assessment. They ask that professionals who work with victims of stalking and offenders take 10-15 minutes to complete their survey, which is available here. Take 10 minutes and fight gender bias. Take the AAUW Implicit bias test. Psychology research shows that most Americans tend to automatically associate positivity with white people and negativity with African Americans, an association that has pervasive effects on our society. Studies of racial bias were some of the first to use implicit measures, which allow for the investigation of attitudes or associations that people may consciously deny, reject, or even be unaware of. Studies using the Implicit Association Test (IAT) have shown that most people more easily associate men with science and women with the arts, men with careers and women with homemaking, and men with being leaders and women with being supporters. According to this article published by VTDigger.org March 6, Vermont’s Child Care Financial Assistance Program (CCFAP), a program to help families afford child care, “is not slated for an increase in the state’s budget for the next fiscal year. Let’s Grow Kids is calling for action. Learn more from Let’s Grow Kids here. In Disparate Access: Head Start and CCDBG Data by Race and Ethnicity, CLASP finds that access to child care subsidies and Head Start is sharply limited for all eligible children and even more so for particular racial and ethnic groups and in particular states. The report confirms low levels of access nationally to Head Start preschool, Early Head Start, and child care funded through the Child Care and Development Block Grant (CCDBG), because of the large gap between current investment and need. It also finds distressingly low levels of access for particular groups of children and includes state-level differences in access by eligible children to Head Start, EHS, and CCDBG. A new initiative by the U.S. Department of Agriculture (USDA) to combat childhood hunger adds to the momentum around ensuring children have the nutrition they need to thrive by allowing states to use Medicaid data, such as family size and income, to directly certify children as eligible for free or reduced price school lunches. Read more from CLASP here. Career Girls is a free, online platform which showcases video clips of diverse women role models sharing career and educational advice to inspire young girls to expand their horizons, improve their academic performance, and dream big about their futures. A recent website update makes it easier to search by interest or activities, to find role models, and includes a robust offering for educators with new lesson plan videos. The Institute for Women’s Policy Research (IWPR) released a new report, The Status of Women in the South, which finds few southern states receive a grade higher than D+ on women’s economic, political, health, and social status. The report is the first report to provide a comprehensive portrait of the status of women, particularly women of color, in the southern states. United States Department of Labor proposes regulations that would impose paid leave requirements on some federal contracts. Read more about it from Common Good Vermont, here. Head to the Expo for a day of fun, inspiration, and pampering. Featuring Over 100 Fabulous Exhibitors, Free Seminars All Day, Goody Bags & Door Prizes, $5.00 Admission – be sure to print the Discount Admission Coupon. Bring a non-perishable item for the food shelf and receive $1.00 off your admission. Learn more here. In their February meeting, the Blue Ribbon Commission on Financing High Quality, Affordable Child Care dug deeper into the factors that drive the cost of quality child care. Learn more about the Commission and its meetings here. Come together to network and share the apps you use and learn about new technology and strategies for streamlining recordkeeping and marketing from everyone in the room. Contact Margaret Ferguson at 802-477-5214 or mferguson@capstonevt.org to register. Join us for Failing Forward: Finding Success from “Failure” a discussion of experiences with failure and moving forward. Panelists include Janice Shade, entrepreneur who founded several businesses including True Soap. Free, but always popular! Register here to save your seat. For more info, email: btvwomen@gmail.com. Nomination deadline: Friday, March 25, 2016 at 4 pm. Every year the Vermont Center for Crime Victim Services solicits nominations for its Crime Victim Service Awards. These awards recognize individuals or programs that, through activism and advocacy, serve crime victims in extraordinary ways. The award winners will be honored at a special ceremony held on Friday April 29, 2016 at 2:00 pm at the Stoweflake Resort, in Honor of National Crime Victims’ Rights Week 2016. Please consider submitting a nomination. Click here for the 2016 Crime Victim Service Awards Nomination Form. FREE wellness workshops and demonstrations. Open to Women Veterans of all ages and fitness levels. Lunch included. Spots are limited: Call Burlington Lakeside Behavioral Health at (802) 657-7090 to register. Featuring: Rosalee Keech, LWV Board/UN Observer, New Jersey Human Trafficking Task Force and Det. Lt. Lance Burnham, Commander, VT State Police “A Troop” Bureau of Criminal Investigation & Polygraph Unit, member of Steering Committee for Human Trafficking Investigation. Please Reply by March 14th to lwvofvt@gmail.com. Anna Eleanor Roosevelt is President & CEO of Goodwill Industries of Northern New England, and granddaughter of President Franklin D. Roosevelt & First Lady Eleanor Roosevelt. This fundraising event will support programs that improve financial stability of women and families in Chittenden County. Tickets may be purchased for $100.00 here. Sponsored tickets are available for those who otherwise cannot afford to attend. For more information, please contact Ruthann Hackett at (802) 861-7831 or ruthann@unitedwaycc.org. Check the Women’s Agricultural Network March Newsletter here, it’s full of interesting events and resources, including a new crop storage planning tool. VT Women in Higher Education 2016 Conference, Register Now! Vermont Women in Higher Education welcomes Mary Powell, president and CEO of Green Mountain Power Corporation, as the keynote speaker. With a theme of “Power Up! Harnessing Your Power, Direct Your Energy and Electrify the World,” the conference is expected to draw higher education professionals from across the state, as well as business leaders and women working in non-profit and related fields. Day one of the conference features two interactive workshops: Lindsey Godwin and Pru Sullivan host “Recharging Your Battery: Plugging into Your Positive Core to Power Up at Work and Beyond,” focusing on boosting women’s emotional health and well-being. “BeingThat Person in Your Department: Addressing Social Justice Issues with Fellow Professionals in Student Affairs and Beyond,” with Jinai Gordon and Meghan Marino, invites participants to explore different ways to create dialogue around social issues in higher education. The 2016 VWHE conference includes dozens of workshops on topics including networking through social media, reconceptualizing leadership, virtual mentoring, and more. This year, VWHE is once again partnering with Dress for Success Burlington to sponsor a clothes swap to benefit the organization. The non-profit provides professional attire, career development tools, and a network of support to disadvantaged women to help promote their economic independence. The event costs $160 per person. For information and to register for the conference, visit vwhe.org. The CAMS Framework Collaborative Assessment & Management of Suicide Training Opportunity Coming to Vermont! Sponsored by the Vermont Department of Mental Health and provided through the Center for Health & Learning. This suite of trainings is for clinicians who see clients at risk for suicide in an outpatient setting, over the course of weeks or months. Learn more and register here. Fee is $479 for all three training components. “Trapped” follows the struggles of health center workers and lawyers who are on the front lines of a battle to keep abortion safe and legal for millions of American women. Since 2010, 288 TRAP (Targeted Regulations of Abortion Providers) laws have been passed by state legislatures. Panel discussion following the film. Admission is free, but RSVP in required in advance. Sponsor: Main Street Landing. Featured guests include Former Governor Madeleine Kunin, Treasurer Beth Pearce and Senator Claire Ayer, in recognition of Retiring Representative Betty Nuovo for her service in the Vermont House. Their signature event brings more than 400 community members together to celebrate their mission and the work they do to build a stronger a community. The Luncheon highlights program participants and the steps they are taking toward self-sufficiency and a future of hope. This year they are honoring David Coates with the Catherine McAuley award. Purchase your tickets here. Every other Wednesday beginning July 13th from 5:00 p.m. to 6:00 p.m. at the V.A. Women’s Comprehensive Care Center in WRJ. This free program provides an opportunity for Veterans to connect with other Veterans, build relationships, read insightful materials, and share experiences. The group will explore a wide variety of materials, including books, movie excerpts, poetry, articles, photos, and short stories. Book groups can create a sense of camaraderie and offer a safe space to reflect and share ideas and questions. Participants receive free copies of all readings, and a light dinner will be provided at each session. his group will be led by Dartmouth Visiting Professor Suzanne Brown and Women Veterans Program Manager Carey Russ. For more information, contact Carey Russ at carey.russ@va.gov or (802) 295-9363 x5743. We are sharing a message from Senator Leahy below– VCW’s own Cary Brown will present a workshop, as will Change the Story’s Lindsey Lathrop-Ryan! I am so proud to announce that we will soon be marking the 20th anniversary of Vermont’s Annual Women’s Economic Opportunity Conference with a keynote address by U.S. Attorney General Loretta Lynch. I hope you can join us on June 4, 2016, at Vermont Technical College in Randolph Center to help celebrate this great Vermont tradition. This conference brings together hundreds of women from around Vermont for a full day of workshops designed to meet all skill levels. In the interest of making the conference accessible to all, there is no charge for registration, lunch or pre-arranged child care – but registration will be required. Look for another email in mid-April to inform you when conference registration opens. You can learn more about the conference and the WEOC tradition on my website, and see tweets from last year’s conference at #LeahyWEOC.